Pammy Blogs Beauty: Holiday Gift Guide 2014: Dermalogica's Limited Edition Skincare Sets! Holiday Gift Guide 2014: Dermalogica's Limited Edition Skincare Sets! What better time of year than the holidays to re-vamp your skincare? Think of it as an early New Year's Resolution! Well, I am so excited that a few of my very favorite skincare brands have released Holiday Skincare Sets! Not only are these sets an incredible value, but also they are a great way to try out a variety of the products from the brand. No matter if you are new to the brand, or a loyal fan, you are bound to find a new love tucked inside these boxes of skincare goodness!!! Not in the market for new skincare? Well, these make awesome gifts, too! Sure, it can be hard to purchase skincare for someone else. The good news is that these sets were packaged with a specific theme or customer in mind. This really helps to take the guesswork out of your selection. For example, do you have a frequent traveler on your gift list this year? Well, the "Our Favorites Gift Set" would be perfect as it contains all travel sized best-selling items! 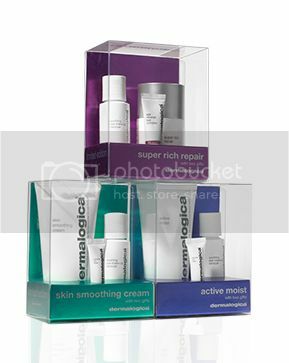 Dermalogica's Active Moist Gift Set: Box Opening!!! The kit that most intrigued me was the Active Moist Gift set. Primarily because I had not tried any of the items in the kit yet...and ya'll know that I love to explore skincare (especially from one of my favorite brands *cough* Dermalogica *cough*). So, today, I am going to share my Dermalogica Holiday Gift Set Box Opening!!! Active Moist (Full Size! 3.4 oz) is Dermalogica's top-selling oil-free moisturizer for Oily/Combo Skin. Even though my combo skin does tend to get drier in the winters, I still love oil-free moisturizers in general. Active Moist is formulated to hydrate and smooth your skin while improving texture. Soothing Eye Makeup Remover (deluxe sample size, 1 oz): My eyes are so sensitive. In the winter they seem to get even more so with the dry air and me constantly battling a cold or sinus infection (it seems). This product promises to dissolve makeup without irritation. Intensive Eye Repair (deluxe sample, 0.1 oz): This is an ultra-rich eye cream with nutrients like Vitamins C and E and Grapeseed Extract. It targets dehydration lines (me!!!) and increases skin's elasticity. This totally sounds up my alley. I am excited to try it! Did any of these sets pique your interest? Are you buying skincare gifts this year? I would love to know!